In this age of social media, it's not uncommon to see a post on twitter or Facebook about the latest and greatest ways to improve running technique. The truth is, how you run (from a technique point of view) is inside-out, not outside-in. Do your hip and ankle joints move freely and easily, without restriction? Are those joints stable and well supported by the muscles and soft tissue that surround them? If you're like most runners, the honest answer is probably, "I'm not sure." To run with a low risk of injury and develop as much speed as your talent will allow, you need certain pre-requisites from a movement quality perspective. Among those are ankle and hip joints that move freely. Simply put, "form work" or running "technique" work, is really frosting on the cake. What's the cake? How you move. Be smart my friends. "Bake the cake" before putting on the "frosting." Doing that will enable you to enjoy lots of smiles and continual progress. Otherwise, you could end up going down a path that will ultimately lead to injury and frustration. Find out where you're restricted or unstable and as a result, more likely to injure yourself as you build running mileage. (If you're not sure how, ask). Based on what you learn, get started immediately on building a true foundation of mobility, stability and strength so that your body is able to handle the repetitive stress inherent in running. Restore balance where its lacking. Do you need MORE mobility / flexibility work, OR...more stability / strength work? Who are you? Build your running mileage and speed smartly and progressively while you also build strength and resiliency. Once you're stable and balanced, you've then got the pre-requisites to move on and refine your running technique. Running technique work is FROSTING on the cake. The cake, is your mobility, stability and overall strength. So if the above is the optimal path, what is the wrong path? Starting a progressive running program without knowing how you move from the inside-out, e.g. anything about your weaknesses or strengths or movement quality. Building your running mileage believing (mistakenly) that the key to improving is simply about running more mileage. Ignoring the pain that starts to develop in your hips, low back, feet or legs. Not only ignoring, but running through that pain. Listening to clueless coaches or training partners who tell you that to fix the pain, you need to change your shoes or simply run more mileage. No frustration as your program starts and then stops (due to injury). More smiles, fun, fitness, and speed! Get in touch. I can help. Endurance athletes pride themselves on pushing through the most challenging, gut-busting workouts. Anyone who is on Facebook sees those "inspirational" memes where the message is always to push-push-push! We like to think of ourselves as tough and willing to push hard and do that little bit extra, even if that "extra" results in some pain that just might be an impending injury. Hey, listen...I get it. I've been there. 🙂 Improving and racing long aren't easy. Sometimes you gotta dig deep, push yourself harder, put in that extra effort if you want to get better, right? But let me ask you a question. Is there a point where that never-ever-quit mindset can be detrimental? The answer to all of these questions is a resounding YES. You've got to put in some extra work and be willing to do some things that most wouldn't. But at the same time, the mindset of "never-quit-no-matter-what" can sometimes do a lot more harm than good. Let me just come right out and say it straight: You're never going to be as sorry for the workouts or sets you didn't do, as much as the ones you DID do that you shouldn't have. In other words, if in doubt, leave it out. A few weeks ago I sent an email to my mailing list, discussing what I believe might possibly be the world's dumbest exercise? (In case you missed that email and post and you'd like to read it, hit me up via email and I'll send it on to you). Unfortunately, Amy's email says it all. If only she had stopped one set earlier or when she started to really feel her form falling apart. Anyone who knows me or has worked with me knows I'm passionate about helping athletes improve, get faster and stronger, and of course avoid injury along the way. What many people don't know, is that the secret to improving and avoiding injury aren't those mobility or stability exercises I continually program. Most injuries occur, not because your core is unstable or you're tight. They happen most often, because of dumb training mistakes. You know, the mistakes you make that at the outset, look like you're being "tough." Going the extra mile. Doing that extra rep or set or workout. Sometimes, the best thing you can do to ensure you'll keep improving is to leave something OUT or stop short, just when it might seem like you could go on forever. I wish I had a dollar for every time I've said, "it's at the moment in time when we feel the most bulletproof, that we're actually the most vulnerable." Not popular to hear, I know. Because hey...we love our toughness and never-say-quit mentality. 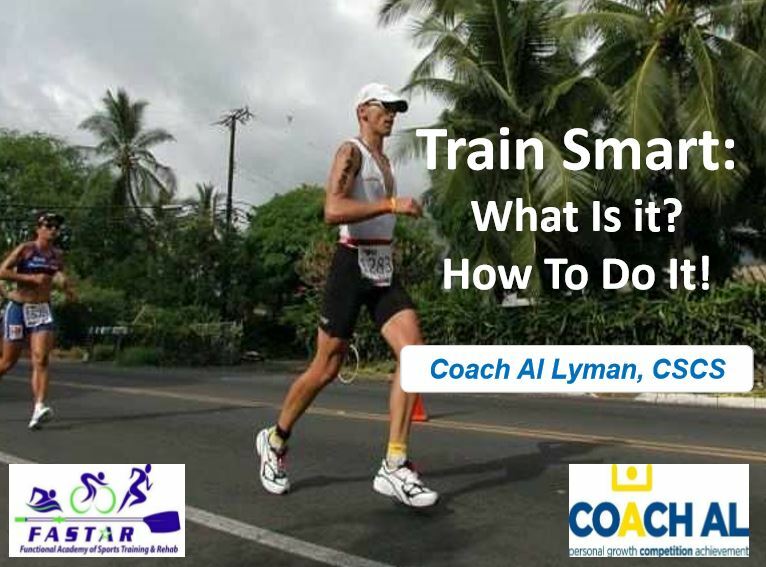 So, a couple of months ago I did a talk for some locals here on the sun-coast that was titled "Train Smart: What Is It? How To Do It!" Goes right along with this theme, ya know? I've got 24 slides from the talk that I'd be happy to share with you. Without a doubt, endurance athletes are finally coming around to understanding and believing in the importance of strength training. Even though it's taken a while, it's great to see. 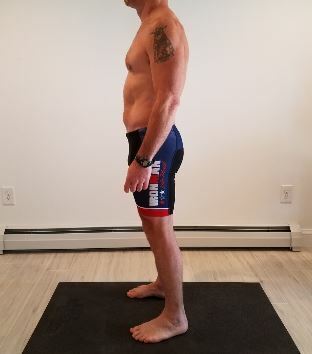 The kinds of "functional" strength work I was experimenting with in the late 1980s to help increase my durability, endurance and speed (while logging a lot less miles than most of my training buddies and competitors), is almost becoming routine now among many competitive triathletes and runners. Along the same lines, it almost "normal" now to sit in the middle of a group of runners or triathletes and hear folks talk about "hitting the gym," or getting in their "leg (or arm) day." That was unheard of even just 10 years ago. Today, smart athletes KNOW that strength work has to be a part of their routine. As a "bonus," the strength trained runner or triathlete looks better. After all, who doesn't want a better physique to go along with our already highly developed cardiovascular fitness? Part of the reason for this gradual shift is likely because baby boomers (like me) are aging. Ack! In addition to their race results or the next ironman, more and more are thinking about their longevity and how well (and gracefully) they'll age. That's a smart thing. 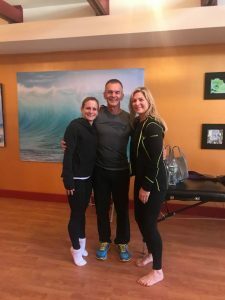 On the topic of strength and maintaining it, I've shared a few links recently that speak to the obvious and profound connections between muscle wasting (sarcopenia) and aging more gracefully. THIS TedTalk called "Muscle Matters," and THIS article from OutsideOnline titled "To Delay Death, Lift Weights," are two examples of what I mean. Definitely take the time to read and listen! Listen, there's absolutely no doubt that strength training is important for every athlete, regardless of your gender or age or experience level. As the above article and TedTalk discuss, there is NO substitute for being strong. In my opinion, every single person ought to put getting stronger at the TOP of their priority list. But at the same time, as someone who works with injured athletes every day, I have to point out the BIG MYTH that exists in so many athlete's minds -- that ALL you need to do is hit the gym and work your arms, abs, back and legs, and you're set. You may think you're doing all you need to do to avoid injury and perform your best, but unfortunately that's not the case. How "ripped" or muscular you are - how much weight you lifted in that gym session last night - none of it has anything at all to do with how durable or injury resistant you are or will be down the road. Here's an example. And yes, in case you're wondering, I see this week in and week out - athletes who can't for the life of them understand why they are so often injured, despite religiously going to the gym to lift weights and get strong. The triathlete pictured here in these two photos contacted me recently to inquire about coaching. He's got talent and as you can see, he's a pretty strong guy. What's his goal? Qualifying for Kona - which is no easy task. In one of his first attempts to qualify, he came really close to getting his slot, proving to himself that he had what it took! However, ever since then his results have tumbled...and NOW, he's dealing with hip pain that has him in physical therapy and making multiple visits to his orthopedic surgeon to try and learn what is going on. To say he's frustrated is an understatement! There are certainly a variety of things in both his movement quality and in his training and recovery that could explain his frustrations. 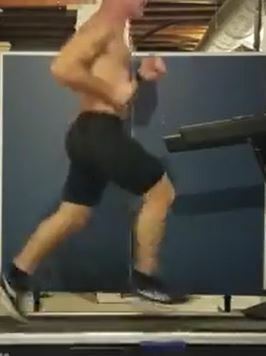 One of the potential answers to that question became very obvious to me as soon as I saw some video of him on the treadmill as part of his Virtual Gait Analysis with me, something I do with EVERY SINGLE athlete I coach. 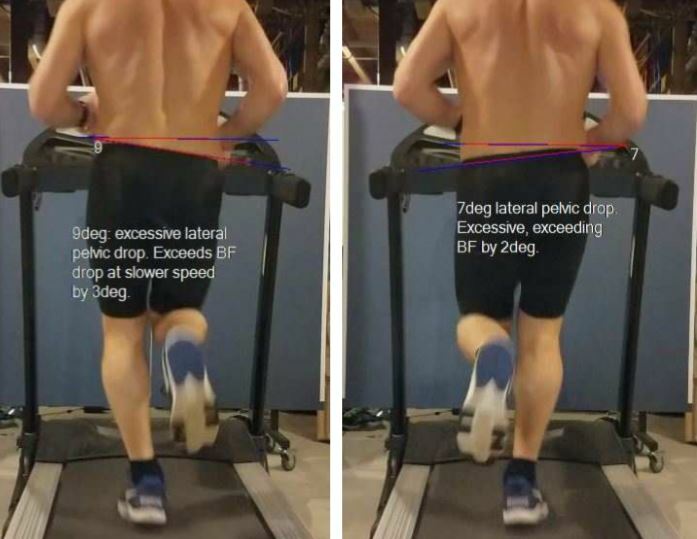 These two images, which I clipped from his run video at mid-stance (or shortly thereafter) of the gait cycle, show an excessive amount of instability of his core and hip girdle, specifically measured here from the back as "lateral pelvic drop." As you can see in the picture, I measured 9 degrees of "drop" on the left leg and 7 degrees of "drop" on the right. To say the amount of instability on a single leg here is significant is an understatement: 2 degrees or less would be considered "ideal" for this athlete. He's at 9 and 7 degrees respectively! Yikes. One thing most don't realize is that this instability has very little to do with the strength of an individual muscle. Or the strength of his body. Or how "ripped" he might be. It has a LOT to do with his nervous system - and the timing of muscle firing. The kind of training that will fix these issues begins in the brain, with basics and fundamentals. If you'd like to know MORE about this topic, you're in luck. I've written lots about it over the years. Start by going to THIS post, where I discuss why mechanics are so important for race-day performance and injury resistance. 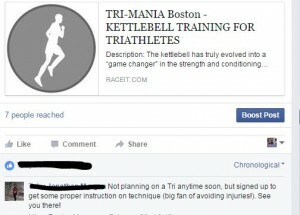 Or THIS post, discussing the truth about why runners become injured. 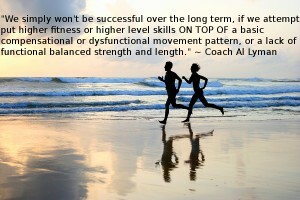 Or THIS one, which discusses the often misunderstood relationship between strength and stability. In fact, use that search function there to dig into many similar kinds of posts. There's much to learn. Luckily, this athlete came to the right place. I'm confident that as he follows my guidance and the process unfolds, we'll see a gradual improvement in his stability. And along with that, his durability and his performance. As soon as possible, he wants to be back out on the roads so he can take advantage of his strength and determination to succeed, and finally reach his goal of qualifying for Kona! So what are YOUR goals? Better yet, how can I help you get past YOUR movement related frustrations so you can go out and reach them? I've always found it fascinating how certain things end up developing a huge following, often becoming so popular they almost develop into cult status. In the fitness world there's a million examples, and no better example than when it comes to building strength. Whether it's body-building vs. powerlifting, barbells / dumbbells vs. kettlebells, or fat-loss vs. crossfit, it's not uncommon to see everything from mild bantering to flat-out arguments flying on twitter and FB between these groups of believers, each out to prove THEIR approach is the right way. What often starts out as a "new," cool way to get stronger, ends up becoming an entirely new belief system...with hard-core disciples that proudly proclaim their allegiance on a cool (and often expensive) t-shirt. Confirmation bias and passion make for a powerful mix! 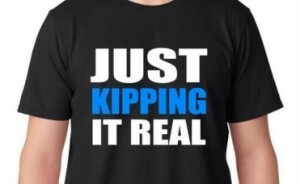 However.....as anyone who knows me well will vouch, I tend to think differently than most. I guess you could say I have sought refuge in being unattached. What does? It's simple: Get strong training, a.k.a. strong person training. How about something even simpler? Movement training. Every tool has pros and cons. For example, bands are convenient and can be taken anywhere. Kettlebells are amazingly versatile, and barbells are cool because you can add lots of weight in small increments. And bodyweight training might be the very best because after all, if you can't control and move your own body against resistance, what right do you have picking up an object to increase your strength? The bottom line? Use the equipment (or no equipment at all) that matches your skill and experience level and best serves the purpose. For me the purpose is simple: to develop "real" strength and improve my overall health. So yes, I will admit that the kettlebell definitely IS one of my OWN preferred tools for strength building and that's one reason why I am leading a Kettlebell Training for Triathletes workshop from 11am to 12pm, at the TRI-MANIA Summit and Expo on Saturday, March 19th, at Boston University's Fit-Rec Center in Boston! You DON'T have to be a triathlete to come out and join in! In fact, check out this note (to the left) from FB, left by a trail-runner who admitted not wanting to do a tri anytime soon, but just wants to learn some good form! Whatever system or method you choose, my advice is to ensure it is BOTH safe and effective. If it is both of these, then it's probably a good choice. So what is YOUR preferred mode for getting stronger? Don't forget - Saturday, March 19th, at Boston University's Fit-Rec Center in Boston - Kettlebell Training for Triathletes workshop from 11am to 12pm.